I feel there is no other comfort food more comforting than soup. Soup is the ultimate staple when one is sick. Soup warms you up when you are cold. Soup just seems to cure whatever ails you. And though we, living in Florida, don’t experience the snow, ice and freezing cold temperatures of our Northern neighbors, it does get cold here. We see several nights a year when the temps dip into the 20’s, the difference here is that an overnight temperature in the 20’s is usually followed by sunshine and highs in the 70’s during the day. I even own a winter coat, or three. When we are cold here, we crave the same thing Northerners crave – soup. 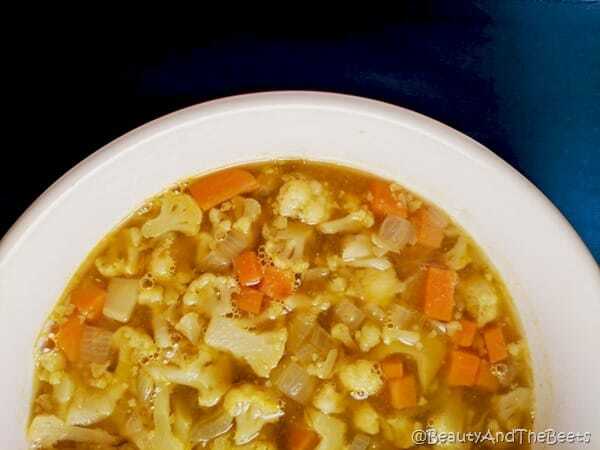 Enter this recipe for Split Pea and Cauliflower Soup. This recipe is directly based off the Forks Over Knives version. Last year I completed a course with Forks Over Knives and became certified in plant based cuisine. 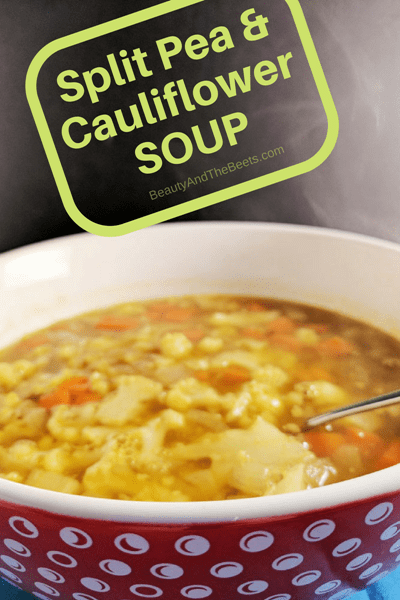 We made hundreds of recipes from sauces to scrambles to soups, and one of those soups is this delicious and amazing Split Pea and Cauliflower Soup. 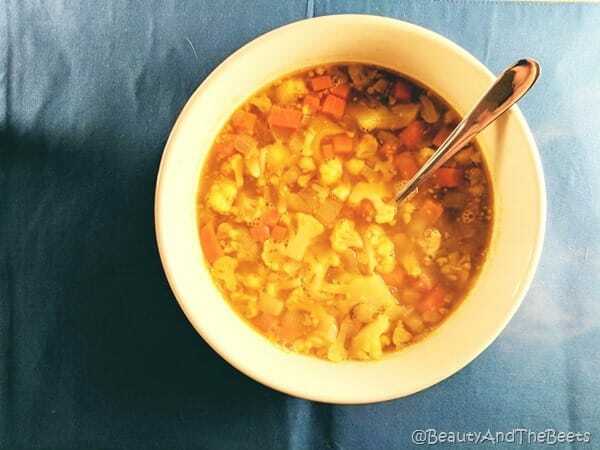 While Split Pea Soup is usually accompanied by ham and/or bacon, this version substitutes cauliflower for the meat. One major error I made the first time I made this was using whole coriander seeds instead of ground coriander. Ya, don’t make that mistake or you will find your guests spitting coriander seeds out of their mouths. Oops. Whole coriander seeds are incredibly powerful and strong. Stick to the ground stuff. 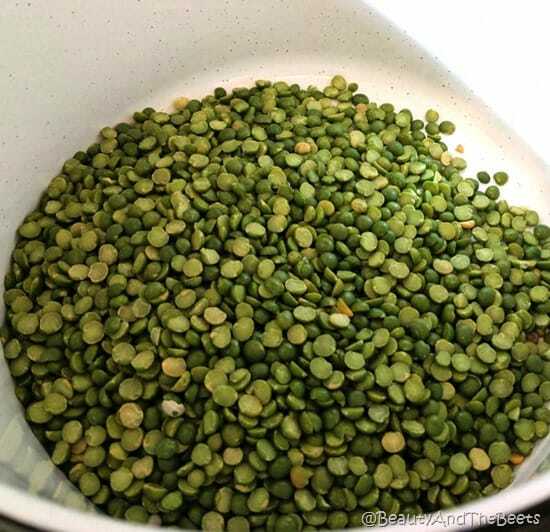 It is best to cook the split peas the same day as making the soup, as you will add the veggies to the peas and the pea cooking water. Just simmer the dried peas in a pot of water for an hour. Cooking the vegetables is easy enough. 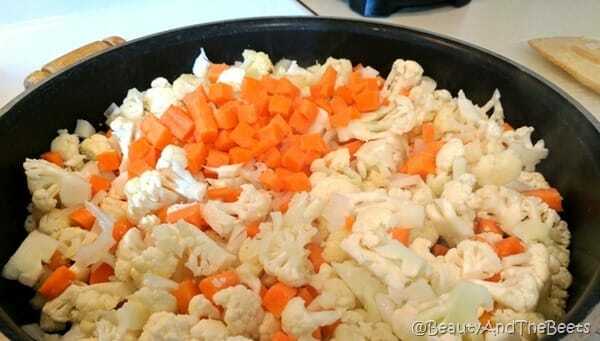 Just sauté them in a large pan, adding water as necessary to keep the veggies from sticking to the pan. There is no oil in this recipe. Add the spices and mix into the veggies. Then add the veggies into the pot of split peas and let simmer for 30 minutes. It’s a very low maintenance recipe with amazing results. I made a few changes to tailor the recipe to my tastes, but for the most part, I followed the Forks Over Knives recipe. For one, I added parsley to add a little healthy dose of vitamin C and clean up the flavor a bit. 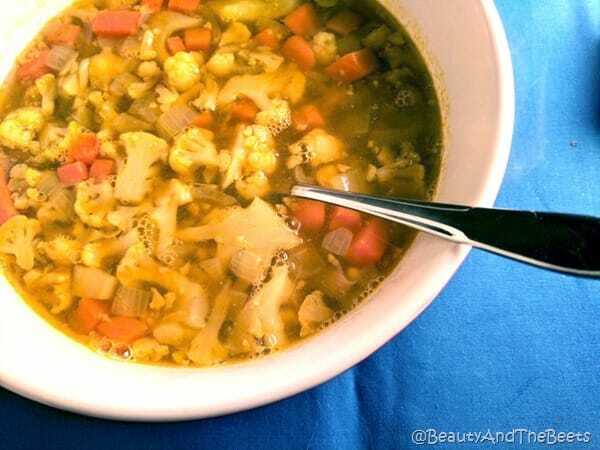 Get the FOK recipe here –> Forks Over Knives Split Pea and Cauliflower Soup. 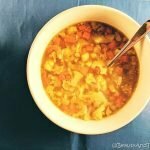 This recipe is based off the soup by Forks Over Knives. In a large stock pot, combine the split peas and vegetable broth and bring to a boil. Then reduce heat to low and simmer for 1 hour. Stir occasionally. Heat a saute pan over medium heat. 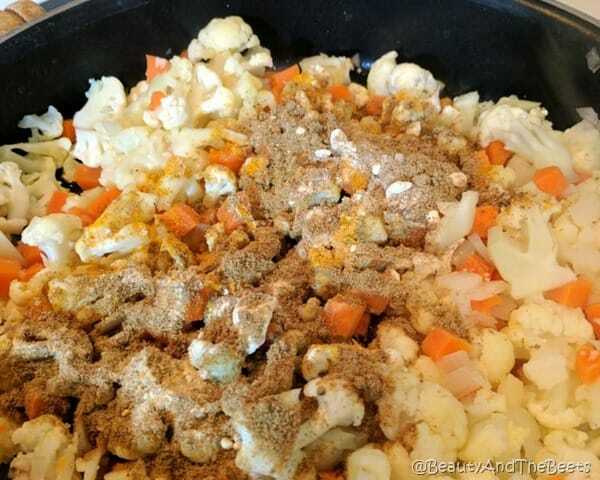 Add the cauliflower, carrots, celery, onion and garlic to the pan. Add 2 tbsp. of water to the pan to prevent sticking. Stir the vegetables, adding more water if needed, until the onions turn translucent and the vegetables begin to brown. Add the parsley and spices and stir until well blended with the vegetables. Add the vegetables to the split pea and water stock pot. Cover and simmer the soup for 30 minutes.